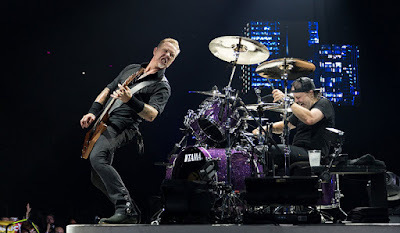 Metallica performed the 1986 classic, “Damage, Inc.”, during their second show at the Ziggo Dome in Amsterdam, Netherlands on September 6, and the band are sharing professional footage from the event. The song was the closing track on the group’s legendary third record, “Master Of Puppets.” Metallica’s major label debut became thrash metal's first platinum album on its way to US sales of more than 6 million copies. A series of 30th anniversary reissues of the album classic will be released on November 10. The limited-edition deluxe box set includes “unreleased demos, rough mixes, interviews and live tracks, many of which have never even been available in the collector or bootleg community and were pulled from our personal collections,” says the band. “There’s also a 108-page hardcover book with rare and never before seen photos and essays from those who were there with us for the wild ride. The pair of Amsterdam dates are part of Metallica’s recently-launched fall arena tour of Europe Europe in support of “Hardwired…To Self-Destruct”, which opened at the Royal Arena in Copenhagen, Denmark on September 2. The fall run will wrap up with two dates in Antwerp, Belgium in early November.